William Gillette's 1916 film 'Sherlock Holmes' is coming to Blu-ray. The film which was rediscovered in the vaults of La Cinémathèque Française last year is being released as a Blu-ray / DVD combo on the 20th October 2015. Sherlock Holmes Baffled: a 30 second Mutoscope film from 1900 which features the earliest known portrayal of Sherlock Holmes on film. A Canine Sherlock Holmes: a British silent film from 1912, starring Spot the Urbanora Dog in the title role. Più forte che Sherlock Holmes: an Italian silent film from 1913 also know as Stronger Than Sherlock Holmes. An Interview with Sir Arthur Conan Doyle and Outtakes from a 1930 broadcast with William Gillette. 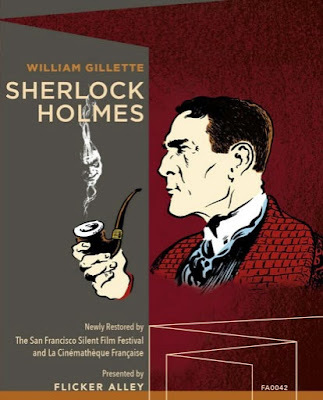 PDF material: including a transcript of Gillette's 1899 play 'Sherlock Holmes: A Drama in Four Acts' and a copy of the original contract between Gillette and Essanay Films. Also included is a booklet which gives information on the restoration project.